U.S. Supreme Court nominee Brett Kavanaugh speaks during the first day of his confirmation hearing in Washington on Sept. 4, 2018. Chaos engulfed the U.S. Senate confirmation hearing for Brett Kavanaugh, President Donald Trump’s Supreme Court pick, as Democrats on Tuesday complained bitterly about Republicans withholding documents about the nominee’s past White House service and shouting protesters were arrested in droves. More than seven hours went by during the Senate judiciary committee hearing before Judge Kavanaugh, the conservative federal appeals court judge Mr. Trump selected for a lifetime job on the top U.S. judicial body, got to deliver his opening statement. Democrats decried the withholding of the documents and sought to have the proceedings adjourned, as Mr. Grassley struggled to maintain order. Protesters, mostly women, took turns yelling as senators spoke, shouting, “This is a travesty of justice,” “Our democracy is broken” and “Vote no on Kavanaugh.” Demonstrators voiced concern about what they saw as the threat posed by judge Kavanaugh to abortion rights, health-care access and gun control. Democratic Senator Cory Booker appealed to Mr. Grassley’s “sense of decency and integrity” and said the withholding of the documents by Republicans and the White House left lawmakers unable to properly vet Judge Kavanaugh. Mr. Grassley deemed the Democrats’ request to halt the hearing “out of order” and accused them of obstruction. Republicans hold a slim Senate majority and can confirm Judge Kavanaugh if they stay united. There were no signs of Republican defections. Mr. Trump blasted the Democrats on Twitter, saying the hearing was “truly a display of how mean, angry and despicable the other side is” and accusing them of “looking to inflict pain and embarrassment” on Judge Kavanaugh. If confirmed, Judge Kavanaugh, 53, is expected to move the court – which already had a conservative majority – further to the right. Senate Democratic leaders have vowed a fierce fight to try to block his confirmation. Democrats signalled they would press Judge Kavanaugh on abortion, gun rights and presidential power when they get to question him starting on Wednesday in a hearing set to run through Friday. Democrats have demanded in vain to see documents relating Judge Kavanaugh’s time as staff secretary to Republican former president George W. Bush from 2003-06. That job involved managing paper flow from advisers to Mr. Bush. Republicans also have released some, but not all, documents concerning Judge Kavanaugh’s two prior years as a lawyer in Mr. Bush’s White House counsel’s office. Republicans have said Democrats have more than enough documents to assess Judge Kavanaugh’s record, including his 12 years of judicial opinions as a judge on the U.S. Court of Appeals for the District of Columbia Circuit. Judge Kavanaugh sat, fingers intertwined, quietly staring ahead at committee members as protesters in the audience screamed while being dragged out of the room. He occasionally jotted notes on paper. “The Supreme Court must never be viewed as a partisan institution,” added Judge Kavanaugh, who also paid tribute to his family and the justice he is nominated to replace, the retiring Anthony Kennedy. Republican Orrin Hatch accused Democratic senators of political opportunism, saying, “We have folks who want to run for president,” although he did not mention any by name. There has been speculation Mr. Booker and Ms. Harris might consider 2020 presidential runs. Mr. Hatch grew visibly irritated as protesters interrupted him. “I think we ought to have this loudmouth removed,” Mr. Hatch said. As the hearing paused for a lunch break, Fred Guttenberg, whose daughter who was killed in the Parkland, Fla., high school mass shooting in February, tried to talk to Judge Kavanaugh, but the nominee turned away. Video of the encounter was shared widely on social media. “I guess he did not want to deal with the reality of gun violence,” Mr. Guttenberg wrote on Twitter afterward. White House spokesman Raj Shah said security intervened before Judge Kavanaugh could shake Mr. Guttenberg’s hand. The Democratic frustrations that boiled over on Tuesday had been simmering for more than two years. Democrats have accused Senate Republican leaders of stealing a Supreme Court seat by refusing to consider Democratic former President Barack Obama’s nominee to the high court Merrick Garland in 2016, allowing Mr. Trump to fill a Supreme Court vacancy instead. Republicans also last year reduced the margin for advancing Supreme Court nominations from 60 votes in the 100-seat Senate to a simple majority in order to force through the confirmation of Mr. Trump’s first high-court nominee, Neil Gorsuch. The hearing gave Democrats a platform to make their case against Judge Kavanaugh ahead of November’s congressional elections in which they are seeking to seize control of Congress from Republicans. Liberals are concerned Judge Kavanaugh could provide a decisive fifth vote on the nine-justice court to overturn or weaken the landmark 1973 Roe v. Wade ruling legalizing abortion nationwide. 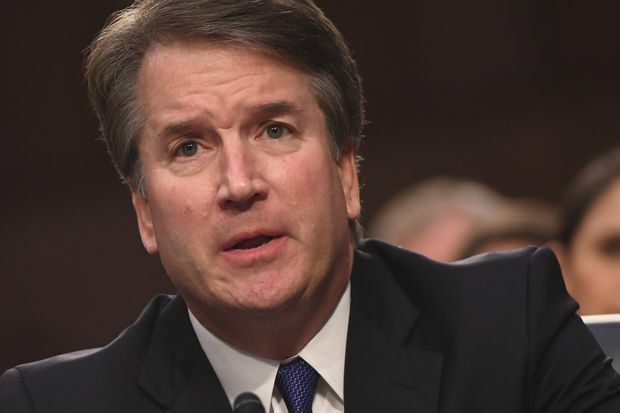 Judge Kavanaugh is likely to be questioned about his views on investigating sitting presidents, special counsel Robert Mueller’s investigation into Russian meddling in the 2016 U.S. presidential election and possible collusion between Moscow and Mr. Trump’s campaign.